Once upon a time… a company called Ziebart used this 1953 Buick to showcase their rustproofing product. Vehicles that have a story to tell always generate more interest. The faded words “Test Car” on the trunk lid and doors should be enough to start any conversation. Buick’s signature waterfall grill, droopy headlights, and port hole vents on the side only add to the mystique of this barn find. The signage on the car begins the tale, and according to the seller, this Buick was a test car to showcase the Ziebart rustproofing product. Plexiglass interior door panels are used to display the effectiveness of the rustproofing. As with any good story, there is a mystery. Why does the seller indicate it was a test car from the 70’s when the car is a 1953 Buick? Although the paint has seen better days, it only adds character. It even appears to retain all the original hubcaps. Hopefully whoever buys it keeps it this way. The chrome and trim are worth the asking price. The seller makes it clear the car does not run, but makes no mention to whether or not the motor will turn over. Somebody needs to trailer this unique car home and begin its next chapter. May it live happily ever after. This car is located in Northeast Ohio, near Fort Wayne, IN, and retains an Indiana title. Find it on Craigslist for $1200. 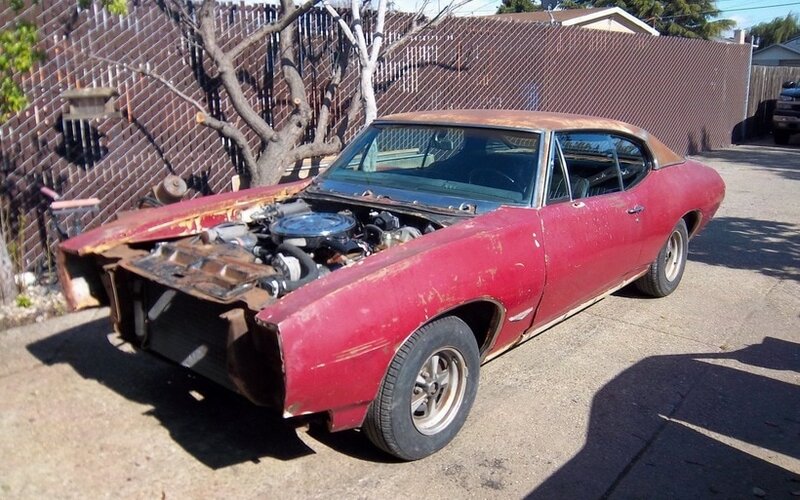 This GTO may need a bit more than Gas, Tires, and Oil, but it does appear to be a decent starting point in the muscle car hobby if you have the skills or funds to tackle the job. Apparently someone was over zealous at taking on a project and began disassembling it before losing interest and leaving it to sit for 35 years. The Pontiac GTO is considered by some to be the first true muscle car. 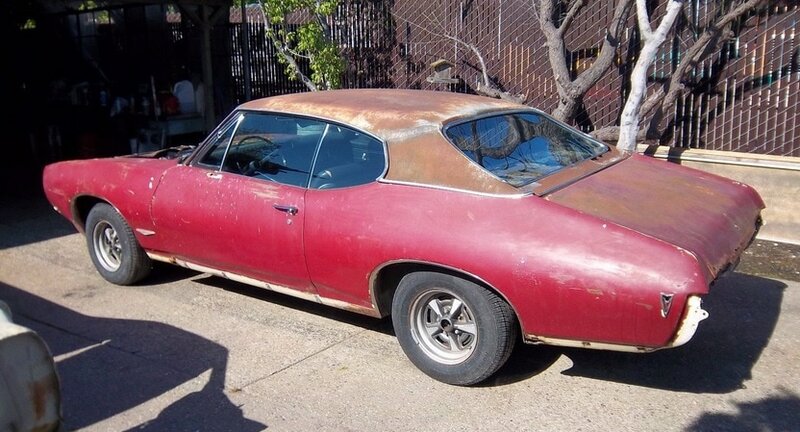 When this car was produced in 1968, the GTO was in a crowded field of competitors in the heyday of muscle cars. This second generation style was redesigned with a shortened body and a gently sloping rear roofline. The headlights also changed back to the horizontal layout and were available with the optional hidden flip up panel hiding the headlights. The center of the front bumper stuck out like a bird beak and was made of an energy absorbing Endura material. Although based on the lower trimmed LeMans and Tempest models, the GTO received more options and was the top of the line. Nice original, or highly restored, examples have a strong interest among collectors. The seller claims this is a numbers matching 400 CI motor paired with a TH400 automatic transmission showing just 75,494 miles since new. The seller also sites rare options such as tilt steering, console his/hers Hurst shifter, power steering and brakes, and air conditioning. The interior is claimed to be original and in good condition which is supported by photos. A California car its entire life, it is a solid car with the exception of some rust found in the trunk pan and around the rear window which is common to vinyl topped cars. The front end pieces do come with the car and the bolts to reassemble it are bagged and labeled, making that assembly a little easier. Find it here on Ebay where reserve has not been met, or Buy It Now for $6800. Is it a bargain or a basketcase? 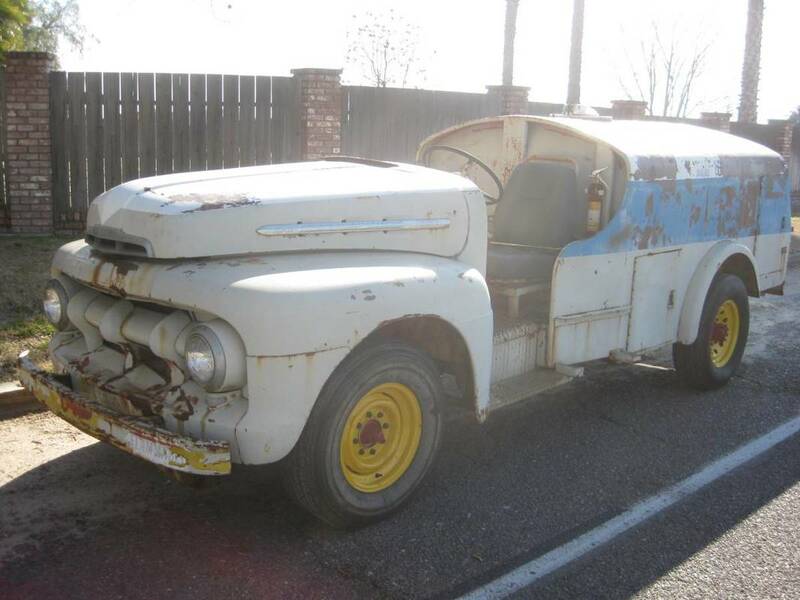 At first glance this 1951 Ford F3 looks to be in need of some major work to get back to original condition. Looks can be deceiving, on closer inspection the missing panels were never there. According to the seller this aviation gasoline tank truck was custom built for Shell Oil Company without a roof or doors and was used at a small airport. Located in California, the dry climate has preserved this interesting piece of automotive history in remarkable condition for more than 6 decades. It is claimed to run well with a Ford flat 6 motor and a 4 speed transmission. Even the PTO for the pump is claimed to work. If you have a hankering for the oddball, look at me vehicle, this might be for you. Maybe a team of clowns could entertain in a parade by going in and out the service doors. Whatever your thoughts are on this truck, whether leaving it as is or restoring it to your tastes, it will no doubt be a conversation piece at local car shows. You can find this California truck on Hemmings for $9500. Finding an entry level car in the old car hobby can be a tricky business; rust from years of aging narrows down the field for most people trying to find a fun project. 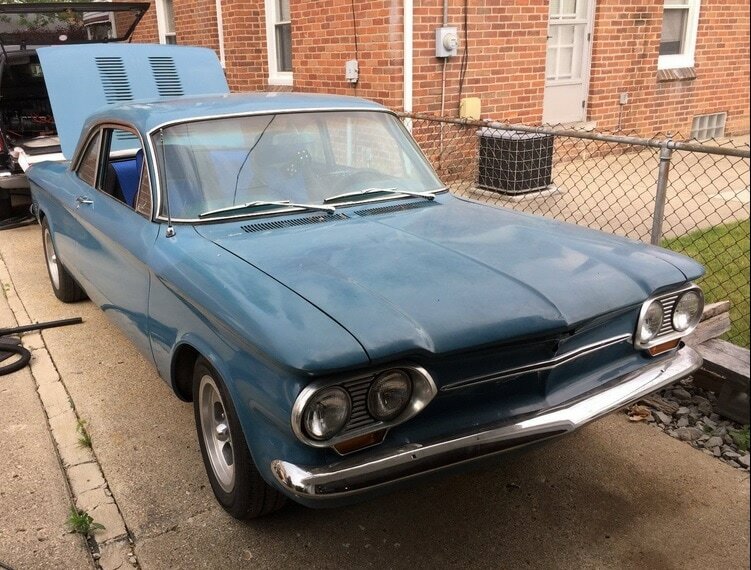 This Chevrolet Corvair is a good candidate for someone trying to get into the car hobby without draining the bank account. The Corvair was an air cooled car with the engine in the back and was designed to be competition to the growing import compact market in the 1960’s. It was initially successful and spawned a sub brand within Chevrolet that also included pickup trucks and vans. A shadow was cast over the brand when Ralph Nader published a book pointing out safety concerns in the automobile industry and singled out the Corvair as his example. The seller describes this car as a project car and does a good job describing both the work that has been done to it and the things needed to finish it. He is also willing to offer access to a lot of extra parts in his garage. The body presents well and is described as solid and originally from Florida. The paint appears shiny, but does look a little thin in a few places based on the pictures provided by the seller. New tires on slot mags as well as an extra set of wheels are mentioned. The turbo motor with a 4 speed transmission should make this car fun to drive. Although a motor rebuild was recently done the owner does indicate more work is needed. Parts are still easily available for these cars should the need arise. Overall, it sounds like the seller has done a lot of work and the car just needs finishing up to be a fun driver that will turn heads. Find it here on E-bay for a Buy It Now price of $3500. I was born with gasoline flowing in my veins. I am a lifelong car enthusiast that started when I was 6 months old and pushing my bottle making vroom sounds. As a teenager I could identify every car coming down the road, even at night. I currently own a 1971 Chevy pickup that I bought sight unseen in California and drove home to Michigan on Route 66. I also own a pair of Shrinner Mini Model T parade cars. I am fortunate to teach Michigan History as a 4th grade teacher and have developed an award winning school presentation on the Model T and the Assembly Line (therefore the reason for the Mini Model T’s). I have also written two children’s books based in 1912 with the early automobile as the focus of the story. My daily stress relief is to scan car sites looking for project cars that I can only dream about putting in my garage.